In preparation for back to school, many stores offer deep discounts on school supplies. We hit the pavement with a school supply list to see just what we could find for a dollar or less! 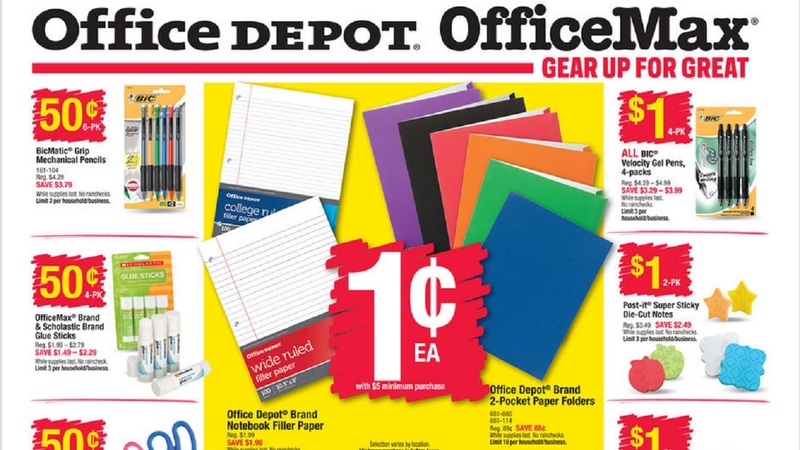 Office Depot is a great place to start because each week during back to school season, they roll out a new list of penny deals. These are items that you can score for just $0.01 each! The only catch is that you must spend at least $5 in the store. Now through Sunday, you can snag packs of notebook filler paper and two-pocket folders for just a penny each! Some of the other great buys are Bic mechanical pencils, a pack of four glue sticks, and scissors for just $0.50 each. Our next stop was Staples. While most stores price match, Staples is offering an extra 10 percent of the difference, making theirs a 110 percent price match guarantee! Be sure to come armed with the circulars from other stores to show proof at the register. Staples is also offering customers a special coupon to save $5 off your next purchase of $25 or more. Just text OFFERS to 555444 and you'll receive the coupon to show your cashier in the store. This week, you can pick up erasers, pencil sharpeners, glue, and one subject notebooks for just a quarter. Index cards, number two pencils, and Crayola markers all come in at under $1 during the sale. Walmart is known for its everyday low prices, but they have rolled back the prices even further for some back to school items. They had the best deal on one subject notebooks at just $0.17 each. They are also the only place where we spotted a deal on dividers at just $0.97 for a pack that would normally cost over $3. This week at Target, all school supplies are BOGO half off! If you have more expensive items to purchase, you may want to check here first. Office Depot will match the price on a new identical item sold by any retailer who sells products in both retail stores and online under the same brand name. Staples promises to beat their competitors prices during back to school shopping time. Find a lower price and show them proof and they'll match the price plus we will discount it by 10 percent of the difference. If you find a lower advertised price on an identical product, show Walmart and they'll match it at the register. There are some guidelines that they follow that you can find online.